The publication in 1962 of Rachel Carson’s book Silent Spring drew public attention to how pesticides had killed much of North America’s songbirds. The book launched an international environmental movement. 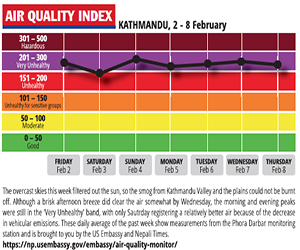 A similar silence has descended upon Kathmandu Valley, as once ubiquitous birds like sparrows and mynahs decline. And ornithologists who have studied this trend say that in Nepal, too, it is the rampant use of pesticides that is mainly to blame. “There is a direct correlation between the increase in pesticide use and the decrease in the number of birds in a neighbourhood,” explains Jyotendra Thakuri of Bird Conservation Nepal (BCN). Pesticides kill insects on which urban birds depend on for food. But there are also other factors at play: traditional brick houses in which sparrows found holes to nest are giving way to concrete façades. Air is being replaced by exhaust fumes. There are few open spaces and vegetation left for the birds. BCN has been conducting urban bird monitoring in Kathmandu Valley and has counted ever-lower numbers of birds each time. 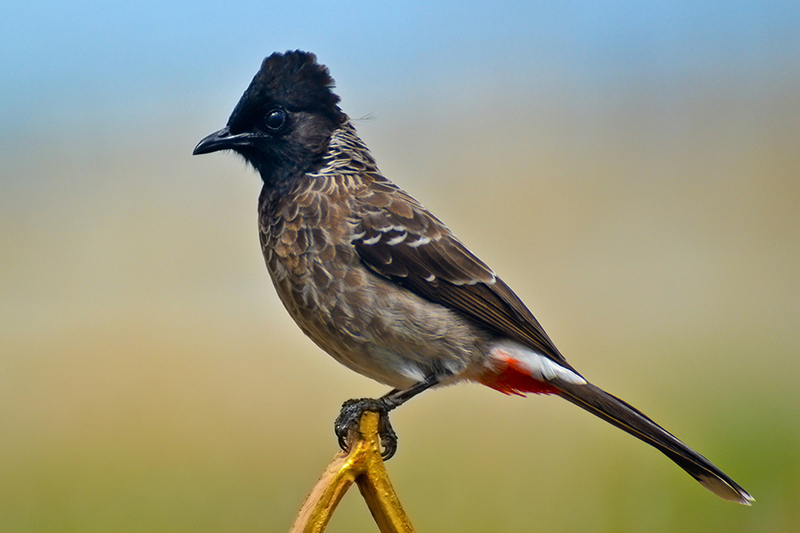 Other common birds like drongo, egrets, red-vented bulbul, owls and even fruit bats are equally hard to find. The house sparrow, once a bird common in every continent except Antarctica, had to be included in the IUCN list of threatened species in 2002 in the UK after a sudden decline in its population. In India, there has been as much as 90% decline in sparrow populations in several states. There, bird experts have conducted research to find that sparrows are scarcer near mobile phone towers. They believe the electromagnetic radiation repels sparrows and other urban birdlife. “As in India, mobile phone towers could also be one of the reasons sparrows are disappearing in Kathmandu,” says Vimal Thapa of BCN. Crows are the other reason for disappearing sparrows as ravens dominate urban ecology and attack young ones of other bird species. Additionally, crows have proliferated because of the Valley’s open garbage and improper management of wastewater. 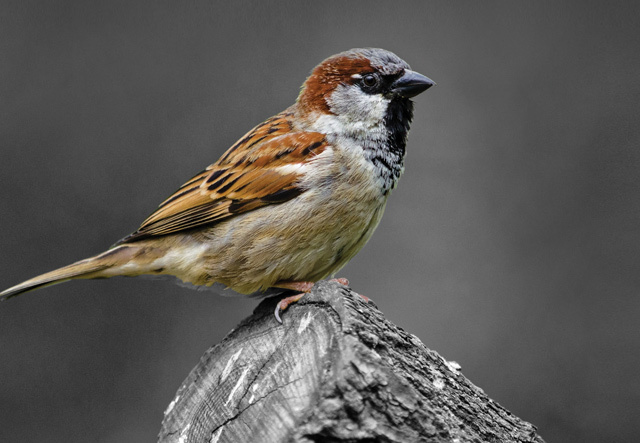 Since 2010, World Sparrow Day is being observed on 20 March, and this year BCN will be marking the day by urging people to take part in an hour-long sparrow-spotting event in their neighbourhoods in order to spread awareness about their declining numbers. Ornithologist Hem Sagar Baral explains that while sparrows are a worry, there are hundreds of other common urban birds whose populations have declined in recent years, including the drongo, shrike, owls, mynahs and magpie robins. When the boys found an eagle stranded in a field in Rautahat district one night last week, they thought they would take the bird home as a pet. But they noticed that it had an electronic device strapped to its back with wires sticking out, and notified the police. The bird was taken to the District Forest Office where officials found it had been fitted with a satellite tracking device and a ring tag. Nepal’s foremost ornithologist Hem Sagar Baral did some investigation, and found out that the eagle had been ringed as a part of a research project involving Korean and Mongolian conservationists studying the migratory routes of raptors between Central Asia and Africa. Steppe Eagles usually migrate from Mongolia across the Himalaya to Nepal and the Subcontinent and the Arabian Peninsula every winter, flying back in summer to breed in Siberia, Korea and Mongolia. It doesn't fly at night and travels individually. In fact, the species was first described to science from Nepal itself by British resident Brian Houghton Hodgson in 1833 and given its scientific name Aquila nipalensis. This particular eagle was chosen while it was a fledgling in the summer of 2016 and strapped with equipment including a Korean SIM card with battery and solar panel, and an aluminum alloy ring with the inscription: oxnith.lab, nst.biol,mongolia 271. After few days it was set free and it was tracked by satellite telemetry as it flew south across China, over Tibet and the Nepal Himalaya to spend the winter in the Bangladesh and returned to Mongolia in spring last year. This year, the eagle seemed to have made the same trip along the same route and was on its way back to Mongolia when it landed in Rautahat district in southern Nepal last week. Baral said the bird looked sick, and explained that it could have been incapacitated by fatigue, bad weather or could have fed on carrion containing the banned anti-inflammatory veterinary drug, diclofenac, which is lethal to raptors. 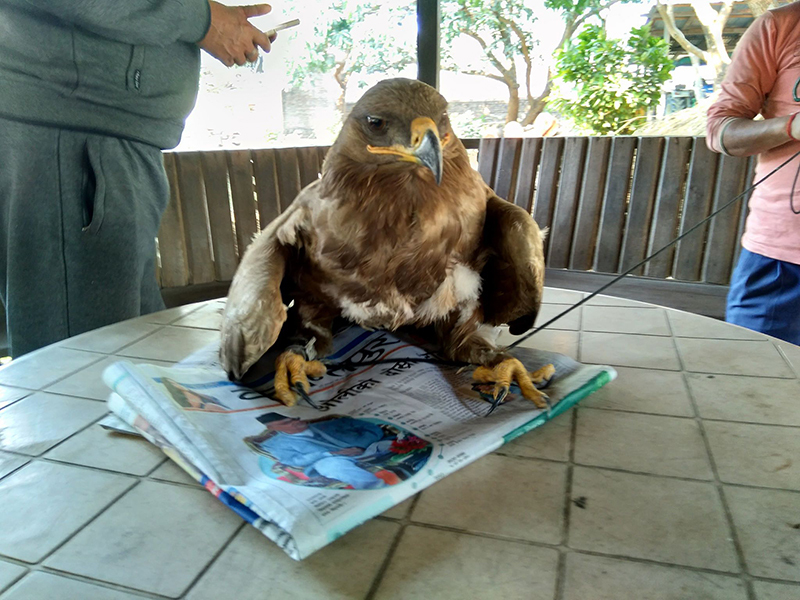 “The eagle is recovering at the Central Zoo and once it is ready, we will let it continue its journey to Mongolia,” Baral told Nepali Times. The most plausible explanation for the grounding of the Mongolian Steppe Eagle in Nepal is that it could have fed on diclofenac-laced carcass. Over 90% of the vultures and eagles in India, Pakistan, Bangladesh and Nepal were killed by the drug in the last 20 years. Although the drug was subsequently banned throughout the region in 2006, Baral says there are other nonsteroidal drugs still being used on livestock that harm vultures and eagles. Bird Conservation Nepal (BCN) has set up a chain of seven ‘vulture restaurants’ across the Tarai and mid-hills in an effort to provide the birds of prey with uncontaminated meat. Jyotendra Thakuri of BCN says that areas with strong community conservation programs in Nepal have seen vulture and eagle populations either stabilising or rising in numbers. 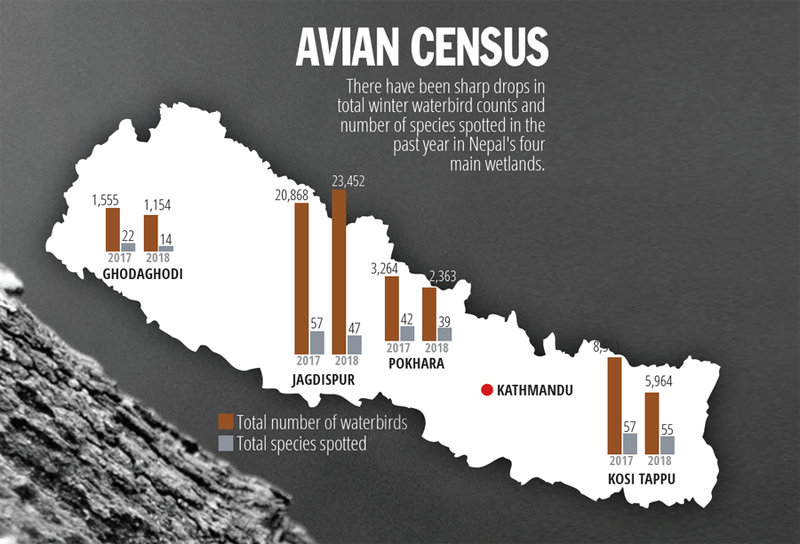 Loss of wetlands, pesticide use and hunting along migratory routes have led to a sharp drop in the number of birds wintering in Nepal, an avian census last month has confirmed. The census was carried out 6-22 January in Kosi Tappu, Chitwan, Bardia and 50 other protected water bodies and lakes across Nepal. Preliminary data shows a decline in both the number of water birds as well as the variety species spotted (see graph below). Nepal is home to 888 species of birds, of which some 212 are migratory and 168 of them are on nationally threatened list. 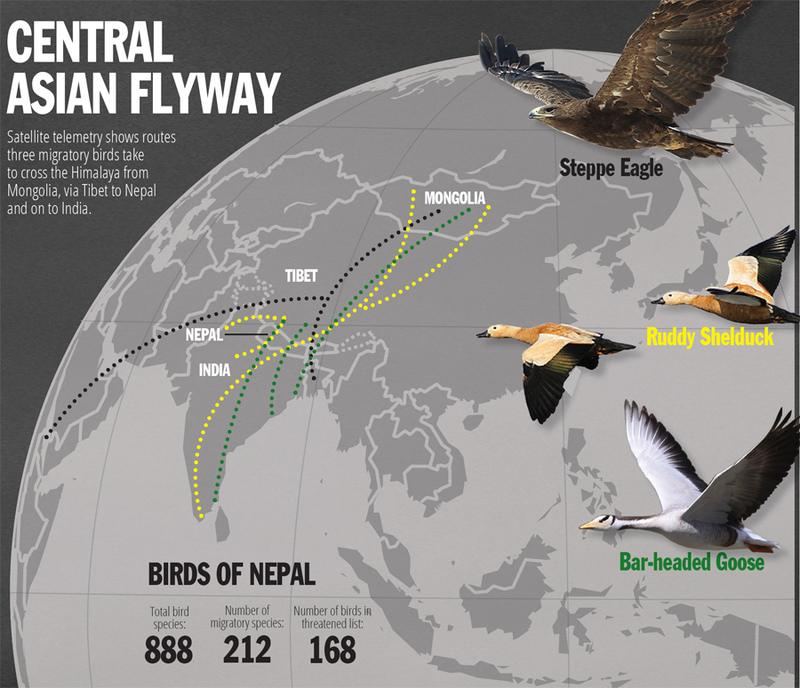 Migratory birds use Nepal’s lakes and rivers as stopovers on their traditional migratory routes. The Steppe Eagles that was found in Saptari last week was on its flight back to Mongolia probably after wintering in Bangladesh. The Himalaya is not a barrier for the raptors, water fowls and cranes as they navigate with inbuilt magnetic sensors along traditional migratory routes. Their lungs and muscles have adapted to flying up to 7,000m. Scientists are now using satellite telemetry to collect information on migration timing, speed of flight, route and stopovers along the Central Asian Flyway which traverses the Himalayan mountains. Data show that waterfowls use three main corridors across Nepal to migrate between Mongolia through Tibet to India: across western Nepal, over Chitwan and through the Kosi Valley. Bar-headed geese, for instance, have been tracked by satellite on overnight flights lasting more than 18 hours from Rajasthan over western Nepal to lakes in Tibet. They stay close to the terrain to take advantage of updrafts, and then when they need to go over mountains ride the jet stream to push them more rapidly to their destination. 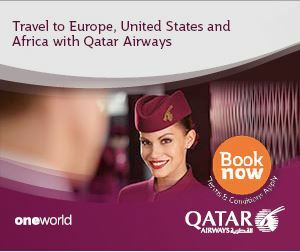 They undertake return journeys in autumn before the jet stream resumes so they don't have headwind. Ruddy shelducks also migrate to and from the Kosi Tappu sanctuary up the river to the Tibetan plateau and further northward towards Siberia. However, all major birding sites like Kosi Tappu, Chitwan, Pokhara, Taudaha, Shuklaphanta, Bardia and Ghodaghodi have recorded fewer sightings in the recent years, both in winter and summer. Migratory bird species common to Nepal until early 2000s like Eurasian curlew, Pallas’s fish eagle, Caspian tern, Baer’s pochard, Eurasian spoonbill and Hodgson's bushchat (left) have not been sighted here since the turn of the century, whereas some residents birds have now become visitors. Until a decade ago, Taudaha used to see up to 2,000 birds in a year, many of them migratory water birds. But this winter the bird count showed less than 150 individuals. Locals lining the perimeter of the lake with concrete to make it a picnic spot could be one reason for the decline.